I was a cleaner at one of the world’s most prestigious art auction houses until I was suspended for protesting. I spoke up to end workplace victimization, implement sick pay, and get a backdated living wage for myself and the other cleaners and porters. I started the job about five years ago. 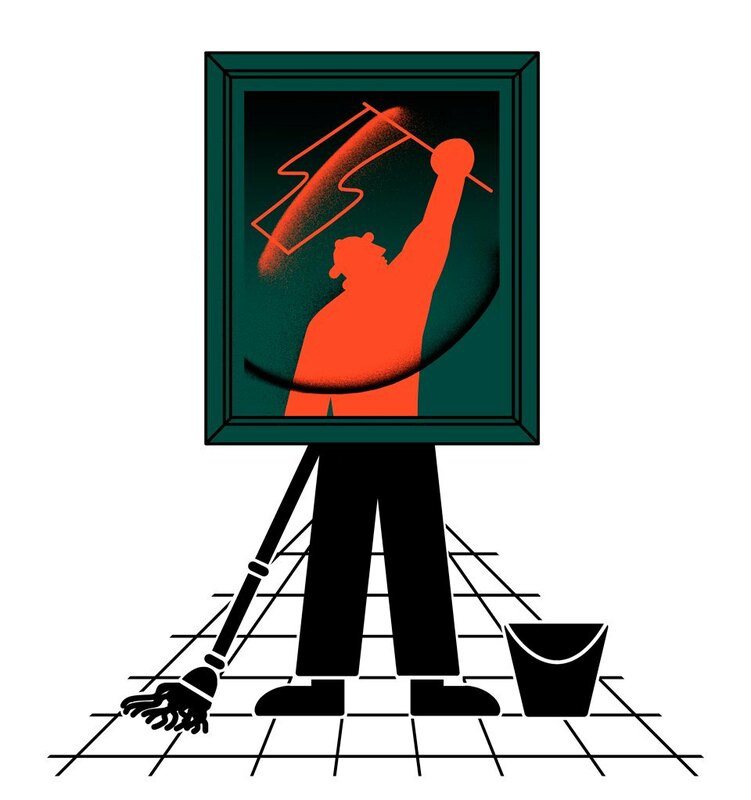 There are three shifts that a cleaner for this particular auction house can have: early morning, day, and evening. I only did the day shift. All of the housekeeping staff, the large majority of whom were also migrant workers, had their own schedule and different specific tasks. I cleaned the offices, bathrooms and kitchens; collected rubbish, vacuumed, dusted—the whole lot. Honestly, it was enjoyable back then; I never had any problems. The team was always happy, my manager never hassled me, and we were treated fairly. I’d come in, do the job, and go home. When the auction house brought in a new contracted cleaning service in 2014, everything changed. The cleaning staff began to get treated really badly. There was so much deliberate pressure which made it so much harder for me to just do my job. Full-time hours were cut because of the auction house’s supposed ‘economic situation,’ yet a full-time assistant manager was hired who made my life hell. I began to be verbally abused—shouted at for no specific reason, hounded about work I supposedly hadn’t done fast enough or at all. I was followed—called even—and asked why I hadn’t finished a task when I was in the middle of it, working as hard as I could. I was given work that wasn’t supposed to be mine, and the more I was bullied, the more confident the bullies became. Some of us couldn’t even go to the toilet and were disciplined for doing so. I was treated like a second-class citizen, when everyone around me who wasn’t a cleaner was treated with respect. I can’t tell you how horrible working in that environment was. The pressure really began to affect me. I wanted to leave, but I couldn’t. If I didn’t work, I couldn’t survive; that’s just how it was. The abuse affected me so badly that I had to go to the hospital. Emotionally, when you totally lose your self-confidence you feel completely worthless. It seemed that whatever I did was never good enough. I tried to report what was happening, and received absolutely no support. Other members of staff were treated the same. Nobody was happy; hours were cut, we were only getting minimum wage, we were receiving abuse from management, we didn’t get sick pay, but when I got a disciplinary letter for being two minutes late, I decided enough was enough. I knew I needed to do something, and I wasn’t alone. A meeting was arranged in the station, and so many people turned up. I had no idea that ten or twelve of the cleaners would actually join a union with me. Once I joined the union, we started a campaign to get a living wage (and get it backdated), sick pay, change the harmful chemical cleaning products we were forced to use which were making some employees ill, end the constant discrimination and victimization we received, and reinstate members of the staff who had been dismissed for speaking up. A lot of pressure was put on the auction house, and eventually we won the terms we had fought so hard to get. It was a proud moment—but a short lived one. After our campaign, the auction house tactically dropped the contracted cleaning service and hired another in its place who refused to implement sick pay or backdate the living wage. I felt so frustrated. Sick pay is so important for people like me. Without sick pay, I only get Statutory Sick Pay, which is like £32 for the first week. With that little money, how can I cover rent? It’s not fair. I went back to the union, and began again to demand the pretty basic terms and conditions most people take for granted: dignity, respect, and fair pay. I didn’t give up. The union started another campaign to pressure the auction house into enforcing the terms and conditions they had originally agreed to. I attended a peaceful and lawful protest on an evening when the auction house was selling famous works of art for millions and millions of pounds. The difference between us and them was so great, it was almost funny. The next day when I went to work, I was told that my removal, along with other cleaners who attended the protest, was requested because, basically, I ‘disrupted’ sales and upset buyers. It’s a joke. It was such a peaceful protest, and that sale made so much money. I just wanted sick pay and to be able to live a dignified life. What upsets me most is how I was treated like a criminal following the protest. When I went to work the next day and was asked to leave, I requested access to my personal locker to get my medication. I wasn’t even allowed to do this without security guards accompanying me, who wouldn’t even let me take my bag inside the building. These people were writing down what I was taking like I was some sort of thief. I felt so humiliated. I’m fighting to get my job back because I haven’t done anything wrong. I had been working there for such a long time. I worked so hard, and we are all entitled to exercise our right to protest. The government doesn’t want to support workers like us—they want to silence us. I mean, now they want to make it effectively illegal to strike and take industrial action. It’s wrong. Unionizing is important because it’s collective power, it’s a voice for the voiceless. The auction house doesn’t appreciate the job I did. I’ve been treated like dirt. Yes, I cleaned the dirt but I am not the dirt. I wish they thought the same.